The Robot Institute of America (1969) deﬁnes robot as “…. a reprogrammable, multi-functional manipulator designed to move materials, parts, tools or specialized devices through various programmed motions for the performance of a variety of tasks”. Robot – An electro-mechanical machine with sensors, electronics and guided by computers. An important part of the automation scene is the area of “Robotics” a multidisciplinary field that involves mechanical, electronics and several other engineering disciplines. Though the ultimate aim is to attempt emulate human activities, something which is extremely difficult to attain, these attempts have resulted in development of robots. These are beneficial in handling hazardous tasks and for operating in hazardous areas like chemical or nuclear plants. Examples of such tasks include plates being x-rayed for inspection of internal cracks and flaws, a routine but hazardous operation. Where complex movements are involved as in welding along a 3D profile, robots can be used for assuring quality and consistency. In assembly operation of precision and tiny parts, like in watches, robots perform with accuracy and repeatability. (The SCARA robot developed in Japan is one such robot specifically suitable for precision assembly tasks.) Painting is hazardous to humans and also complex movements are involved (for example in painting a car body) and in such applications robots may replace human beings. Robots have certain inherent capabilities and limitations, just as any other machine or human being does, and these should be borne in mind when attempting to use them in a given application. A lathe is best used for generating cylindrical objects and milling machines are ideal for producing prismatic parts. One would not attempt to use a lathe for manufacture of prismatic parts or a milling machine to produce cylinders. Thus manufacturing processes are chosen to suit the product and conversely, products should be designed to suit the manufacturing process. This philosophy applies to robotics also. One cannot expect a given robot to execute any arbitrary task or handle any product. Some times it may be beneficial to redesign the product to enable robots to handle them with ease. A well known example of designing a product to suit robots is the SONY “Walkman” which has been designed for ease of assembly by robots. Computers are required for higher level control of such complex systems. Computers convert higher level commands to lower level commands for purpose of interpreting sensor outputs and controlling motors in these machines. In autonomous robots, operating at remote locations, endurance of power supply (batteries) may be an issue. 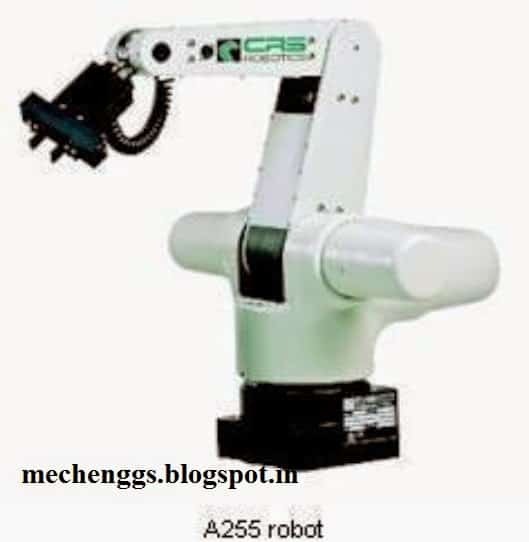 Robots used in manufacturing are examples of fixed robots. They can not move their base away from the work being done. 2. Mobile- Mobile bases are typically platforms with wheels or tracks attached. The PTP robot is capable of moving from one point to another point. The locations are recorded in the control memory. PTP robots do not control the path to get from one point to the next point. The CP robot is capable of performing movements along the controlled path. With CP from one control, the robot can stop at any specified point along the controlled path. All the points along the path must be stored explicitly in the robot’s control memory. Applications Straight-line motion is the simplest example for this type of robot. Some continuous-path controlled robots also have the capability to follow a smooth curve path that has been defined by the programmer. In such cases the programmer manually moves the robot arm through the desired path and the controller unit stores a large number of individual point locations along the path in memory (teach-in). In controlled-path robots, the control equipment can generate paths of different geometry such as straight lines, circles, and interpolated curves with a high degree of accuracy. Good accuracy can be obtained at any point along the specified path. Only the start and finish points and the path definition function must be stored in the robot’s control memory. It is important to mention that all controlled-path robots have a servo capability to correct their path. keep visiting will update soon…..